Minnesota's Top-Rated Tourist Attraction for Over Ten Years! Let a Segway be your two-wheeled steed as you explore new surroundings, or take a fresh look at places you thought you knew. HumanOnaStick™ Segway Tours takes you there with public tours available every day from March 1st to November 31st. Celebrate The Cities with our open tour options or with private tours for one or groups of up to eighty. Beginning with our launch at the Minnesota State Fair in 2004, HumanOnaStick™ was the first Segway tour company in the USA and has been providing Segway tours of Minneapolis and St Paul for over fourteen years. Bring your sense of adventure; we’ll provide everything else you need for an unforgettable Segway experience. 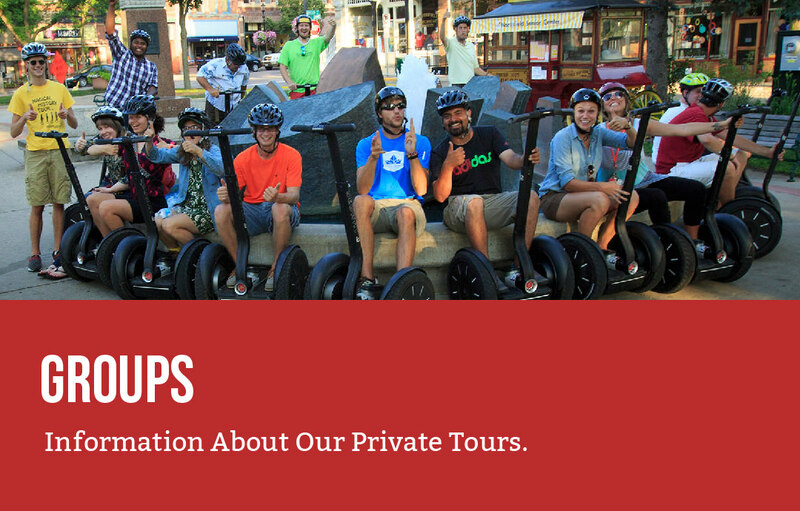 Our most popular tour, this Magical History Tour, is a three-hour Segway exploration covering both sides of the fabled Mississippi River and the city’s downtown historic district. Immerse yourself in over a century of history on this six-mile adventure. Cross the graceful Stone Arch Bridge, visit the Minnesota Historical Society’s Mill City Museum for refreshments, and cruise by Gold Medal Park on the Mississippi riverfront below the world-famous Guthrie Theater. This tour sells out several times a day and is perfect for beginners and experts alike. 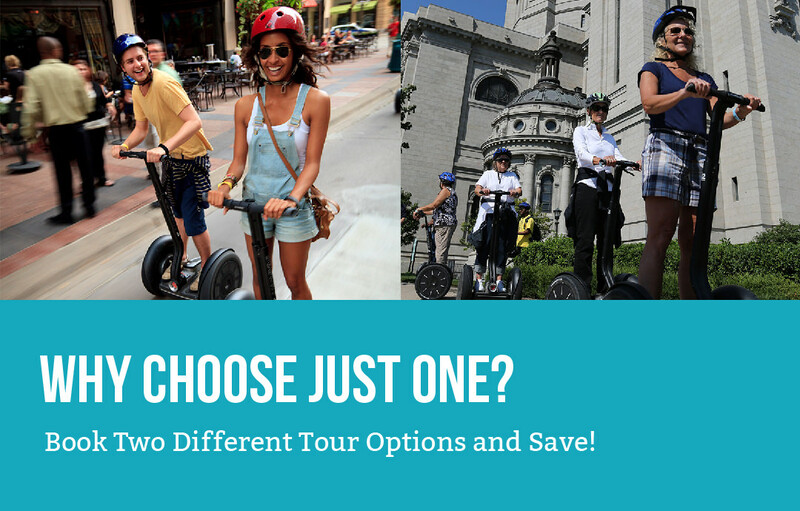 Each of our tours starts with thirty minutes of Segway Certified Training™ by our professional guides to ensure a safe, confident experience. Our original Segway tour we began running in 2003. A perfect tour for beginners, we stay largely on bike trails throughout the tour. Mid-point break with snacks and soda fountain beverages. All of our tours have a lead guide narrating content along the route and helper guides to ensure all riders have a safe, fun time. Experience the Upper Mississippi River like never before, designated a U.S. National Park since 1988. Our St. Paul History Tour is our second most popular tour featuring the beautiful, historic mansions of Summit Avenue, including the homes of F. Scott Fitzgerald, James J Hill, and Garrison Keillor. Ride the sidewalks, bikeways and hidden back alleys. See the stunning St Paul Cathedral, the Minnesota State Capitol and Veterans Memorial Park. Learn the city’s history going back to the time of Mark Twain and before. This illuminating three-hour tour covers over seven miles with a refreshment stop at the Minnesota History Center. The tour starts and finishes at the St. Paul Curling Club with free parking and featured restaurants nearby. Includes time to explore the Minnesota State Capitol grounds. Small group sizes on tour. Mid-point break with snacks at the Minnesota History Center. We’ve updated the popular Sculpture Garden Tour for 2018! Perfect for experienced Segway explorers and first -timers alike, this eight-mile tour is filled with amazing architecture, breathtaking public art, and little-known facts about our city. 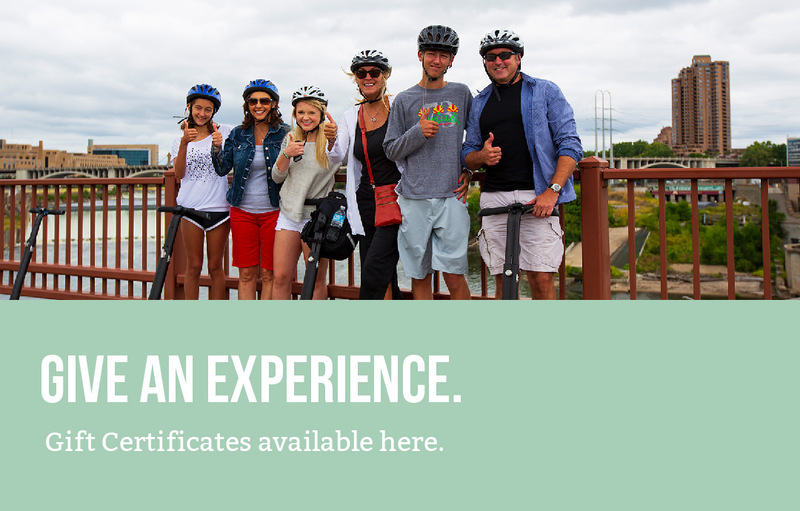 Ride from our office in trendy Northeast Minneapolis and discover some of the city’s most iconic sights and best kept secrets. See Target Field and the extraordinary Walker Sculpture Garden. After refreshments and a restroom break, return via Loring Park—Minneapolis’ oldest—and the newly renovated Nicollet Mall featuring the famous Mary Tyler Moore statue. Then across the Hennepin Avenue Bridge, the first bridge over the Mississippi, to complete the tour. Don’t just see the sights; be one as passersby snap photos of our groups as we ride through town. Free-ride time provided at the new Walker Sculpture Garden. Explore the newly renovated Nicollet Mall. This tour also highlights art and architecture of the city. Our locations are easy to find. See for yourself! Want to learn more about the area? Have a question about one of our tours? You’ve got Questions. We’ve got Answers!